This compact and light practice cushion is attached to the lower arm using a strap with a Velcro fastener that is the perfect addition to our Patient Care Manikin. The new design improves the placement of the simulator and has a realistic appearance. 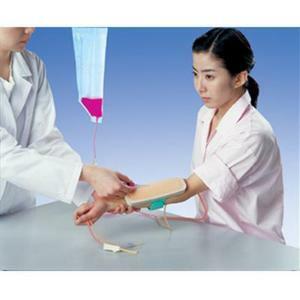 Puncture methods for blood withdrawal and injection can be practiced in a realistic manner with the representation of the superficial and deep vein system. Blood bag included, without blood plasma substitutes and tripod.